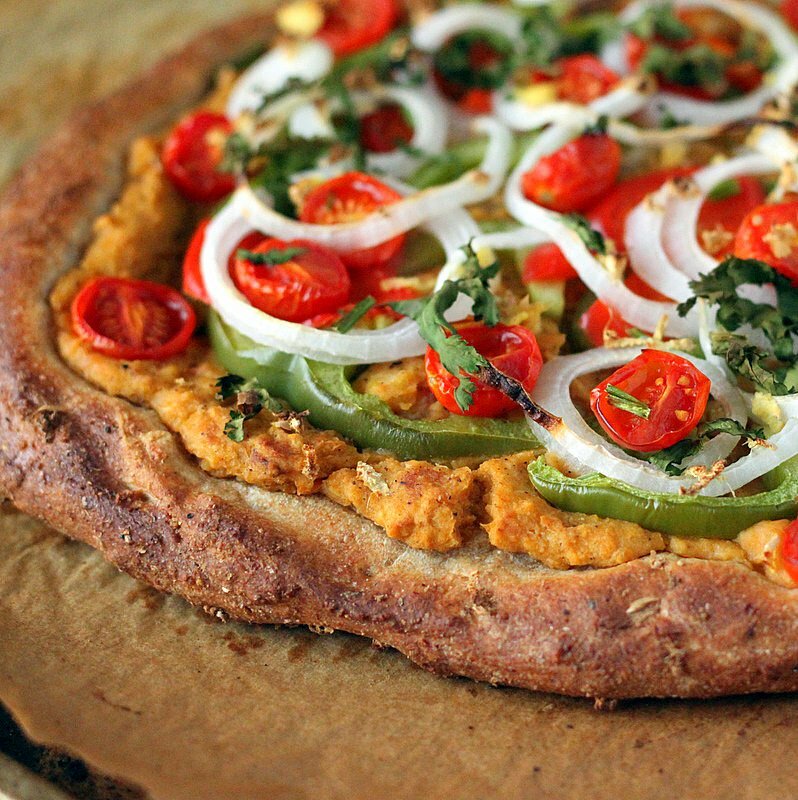 The pizza toppings have indian flavors with the Chana masala Spice hummus, some grated fresh ginger and cilantro garnish.. You can make it your own to taste! This was our quick weekend lunch/brunch.. I had some dough from the day before. So a quick veggie prep… a spicy hummus and voila! For a GF version, use this Focaccia style GF crust. Top with hummus and toppings. Spray water liberally on the pizza edges, and bake as mentioned. Also below is my basic Pizza dough. Half whole wheat, half bread flour. I sometimes add some herbs and garlic to the base for added oomph! As I am editing the pictures, I am craving a light roasted garlic and tomato version! Pizzas end up being last minute put together meals and no one wants to wait for a photo session.. Who likes a cold Pizza! :) The Pizza dough can be easily doubled and also refrigerated. Take it out and let it rest for half an hour or as I sometimes do, I just put the container(I usually store in a glass container with a lid) in a warm oven for 10 or so minutes until it dough becomes pliable. What is your favorite Pizza topping? and your quick go to lunch. A delicious pizza topped with Chana Masala Hummus and Cherry Tomatoes. Add 1/4 cup whole wheat flour, 1/4 cup bread flour, salt and evoo and mix with a large spoon. Add a Tablespoon or more bread flour if needed, to get the dough together into soft not too sticky state.Cover with a towel and Let it rise in a warm place for an hour. You can refrigerate the dough at this point in a closed container. Take the dough out when you want to use it, keep in a warm 100 degree F oven for 10-15 minutes and continue. Take the dough out on the counter and use some bread flour to make it less sticky. You can knead it for 2-3 minutes if you dont like sticky messy dough. I usually just throw it on the counter and then gather. Then make a flat ball and pat it on the parchment. Roll it between 2 parchments after dusting with bread flour, or just pull it on all sides. The thickness of the dough will not be even with the pulling, but thats what gives it a hand made rustic feel. You can roll it to as large as 12 inches. The dough will be very elastic, so pull and hold it down for 10 seconds and then pull on opposite sides and so on. Once desired shape is achieved. Spray warm water on top. Cover lightly with a towel an let rest till you prep the veggies. Or go on ahead with the toppings if everything is ready! Spread the hummus evenly on the dough. Pile your favorite veggies on top of the Hummus. Sprinkle salt and pepper, grated ginger and cilantro. Remove, let cool for a minute. Slice and serve! Top with some fresh Cilantro, herbs, micro greens. Add a teaspoon of olive oil to a medium pan, heat on medium. Add 4-5 cloves of garlic, chopped, 1 red chili or green chili to taste and 1 teaspoon chana masala spice blend (or garam masala), and cook for 2 minutes. Add 2/3 cup cooked/canned chickpeas, 1/2 teaspoon salt or to taste and 1 medium tomato, chopped. Stir and cook for 3-4 minutes. Let cool a bit and blend with a Tablespoon or 2 of water, lemon juice to taste and a Tbsp of extra virgin olive oil to get a spreadable consistency hummus. Taste and adjust salt and spice. You can blend the ingredients without cooking to make the hummus too( I like garlic cooked). Or use leftover Chana masala curry/chole for this as well.. Blend the chana masala with a little water, evoo and a clove of garlic. Or dont blend and use the Chana masala as the topping! I use a regular baking tray most days. If using a pizza stone, let the pizza stone get hot in the oven for atleast 20 minutes. Use leftover Chana masala curry/chole for this as well.. Blend the chana masala with a little water, evoo and a clove of garlic. Or dont blend and use the Chana masala as the topping! Toppings: We used sliced Green bell pepper, Red bell pepper and white onion. Halved Cherry tomatoes, a Tablespoon grated ginger, 2 Tablespoons chopped cilantro. You can add anything really, greens, squashes, roasted garlic any veggies of choice. This is awesome Richa. I love hummus with toasted pita bread. But never thought of baking it. Doesn’t it make it crusty and dry? Looks beautiful. I might make it this weekend. Thanks Champa. I made the hummus a bit thinner so that it spreads easily and that stays moist. Bake time is just 12-15 minutes, so it holds fine. Let me know when you do make it! This sounds seriously amazing! I love channa masala, and hummus made with it would be delicious…I need to try making it! 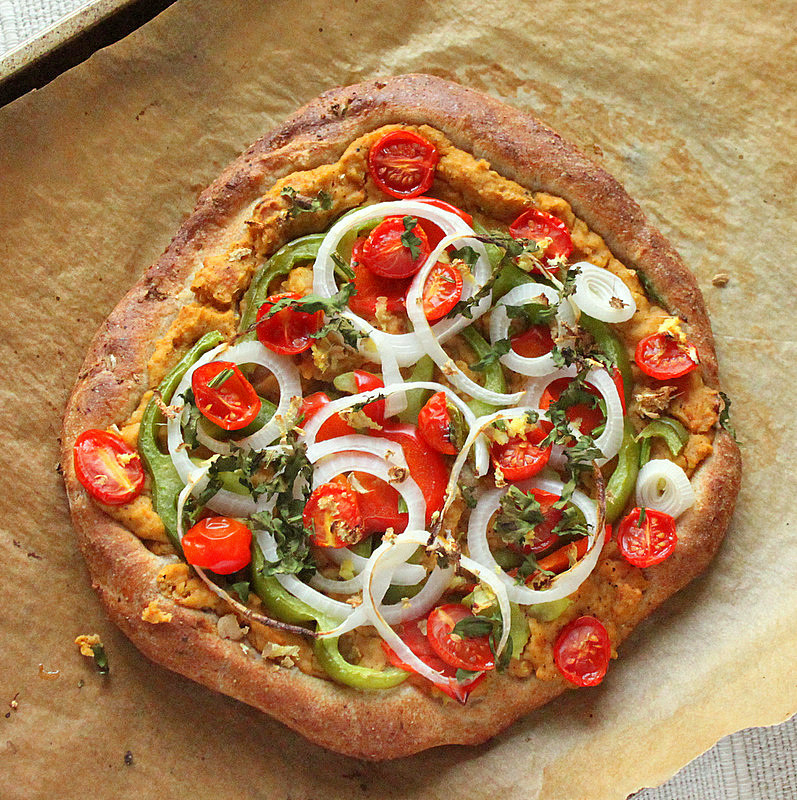 The pizza as a whole looks wonderful with all of the veggies along with the hummus. I would love some for dinner tonight! Thanks Amy.. Do let me know when you try it! That is one awesome looking pizza!! Love the flavors on this one!! hummus is my favorite…chana masala hummus must be damn good. i can already feel and see it…. i have to make the chana masala hummus soon…. Some days i just make the leftover chana masala into hummus with some addded garlic and spice.. freshens it up and increaes the possibilities! I made hummus and was thinking of something similar, basically because hummus is so good with just anything and esp flatbreads! The pizza looks vibrant, delicious and lipsmacking! *Sitting here with eyes wide open* <–That is about as much as I can say other than, WOW! Thank you RG.. naah, i dont think i am going to get funding for that.. plus restaurant business is harsh! wow i love this combination of ingredients! channa masala powder in hummus? wow, i LOVE it! what a creative pizza! sounds delicious! This looks delicious! I would definitely opt into the Gluten Free option- made a tasty GF pizza crust last week (http://meghantelpnerblog.com/recipe-loving-2/?recipe_id=6017513). Will have to give your version a try! Thanks Meghan! 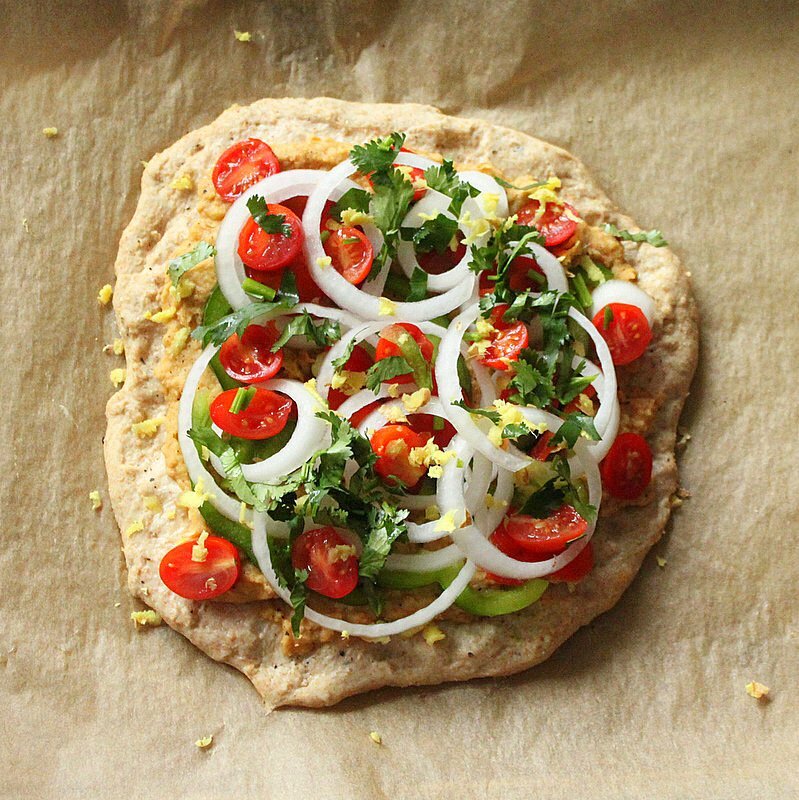 i like chickpea flour crusts for thin crust pizzas too! Let me know when you try this out! 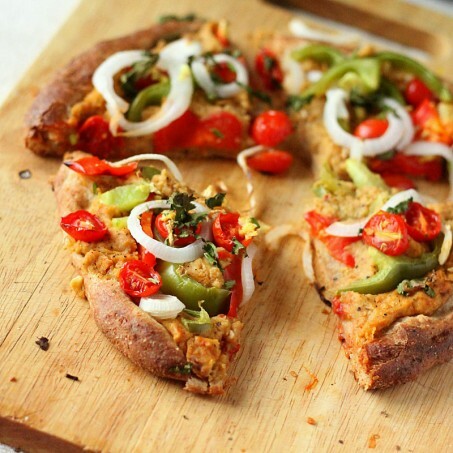 Delicious channa masala pizza. Thanks for sharing with Hearth and soul blog hop. My son can’t have dairy and I have long wondered what to use to substitute for the cheese – hummus is a brilliant solution! I must thank you for your continued inspiration. Although we are not vegans, I find many dairy-free solutions for my family from your recipes. Thanks Alea. Hope your son likes all these creations and doesnt feel like he is missing out on anything. I LOVE homemade Pizza – I’ll tell you what, you make me this and I will make you the Bread Pudding and Cottage Pie; Deal? Okay, Deal! Mmmm all the flavors on that pizza look incredible – and that crust, that crust is calling out to me! Yes Heather,, its a deal.. let me know when you are dropping by Seattle. We have a gorgeous summer! with the sea 2 blocks from home and the mountains half an hour away!